Don't scream. It only entices them, and when you stop, the real terror begins. In the moments between your cries, the monsters are released, profane and insatiable. Werewolves, witches, vampires and creatures never named prowl from the darkness. Soul collectors knock on your door while animals you won't find at the zoo slither through the yard around the dead bodies. Angels hover over your house, just in case. Behind them, in the bushes, demons wait for the same reason. A storm brews in the distance, ready to sweep you up and take you away, but to where? And would it be better than here where you're afraid to stop screaming and machinery hidden in the clouds has covered the sky? A collection of horror shorts that will give you the willies, that’s what you’ll find in Christopher Hivner’s The Spaces Between Your Screams. This horror anthology featured stories of the supernatural, ghosts and demons, murder and mayhem, lust and greed, and blood and gore, with a side of humor for good measure. There were so many stories in this anthology of ghoulish tales that it would be impossible for me to discuss them all, roughly forty-one, give or take. Sufficient to say, there were several I really enjoyed, some I didn’t, and a few that made me go, “hmm…” Mr. Hivner has a wonderfully creative imagination when it comes to the strange and bizarre. One of the things I enjoyed most about his book is that each story is short enough to not drag on, but long enough to get your attention. It’s the perfect collection if you’re short on time, but want to get in a quick read, start to finish. You could easily read the entire book in a few days, or take your time and spread out his gruesome tales over a few weeks and not feel like you’ve missed something along the way. I did notice some editing errors and questionable point-of-view violations, but nothing that really took away from the book as a whole. Overall, I enjoyed reading it and would probably recommend it to anyone who likes horror. A word of caution to young readers, although minimal, there are some sexual situations and/or references in a few stories that may be inappropriate for readers younger than 17. Do you like being scared witless? Were morbid television series like Tales From the Crypt right up your alley? 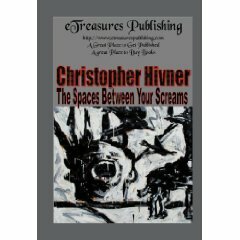 Then grab a copy of Christopher Hivner’s The Spaces Between Your Screams, you’re bound to find at least a few stories in his macabre anthology that will set you’re teeth a chatterin’.